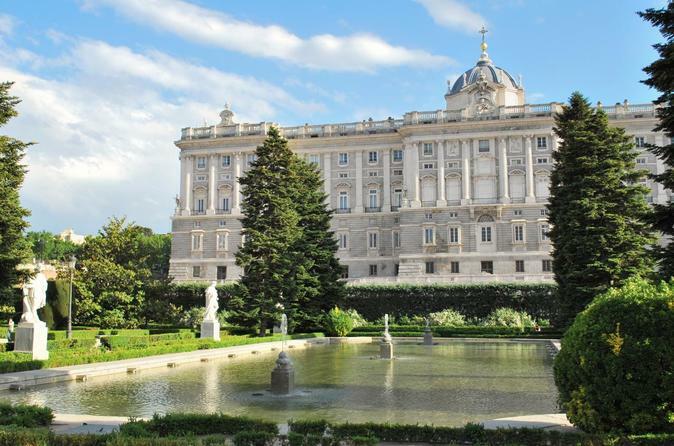 Explore Madrid in comfort and visit the biggest palace in Western Europe - The Royal Palace. Puerta de Alcalá - Cibeles fountain - Thyssen museum - Neptuno fountain - Atocha station- Reina Sofía museum - Puerta de Toledo - San Francisco el Grand Basilica - Puerta del Sol - House of Deputies (Congress) - Gran Vía - España square - Temple of Debod - The Cathedral - The Royal Palace. After the panoramic tour you will have time to visit and enjoy the Royal Palace at your leisure. This is a monumental construction of 135,000 square metres, and is the biggest palace in Western Europe. There are almost 3,500 halls and rooms. It is superbly situated, with beautiful surroundings: the Sabatini gardens (North), the Cathedral (South), Plaza de Oriente (East), and the Campo del Moro gardens (West). The Royal Palace of Madrid was first used by King Carlos III in 1764. Later, it was the residence of all subsequent Spanish monarchs until 1931, when King Alfonso XIII left Spain for exile when the Second Republic was created. Currently, the Royal Palace of Madrid is still full of life, as it is used for various ceremonies and official events by the monarch, although it is no longer a royal residence. The Royal Palace contains a wealth of great art in the form of paintings, sculptures, porcelains, tapestries and jewelry work. Out of all its displays, the sheer beauty of the following stand out: the Hall of Columns, the Throne Room, the Stradivarius Room, the Porcelain Room, Gasparini’s Salon, and the State Banqueting Hall. Outside the Royal Palace there is a small building, to the left of the ‘Plaza de la Armería’. Don’t miss it. It is the Royal Armoury, which is regarded as one of the two most important in the world, together with the one in Vienna. You can also visit the Royal Pharmacy, and stroll through the large gardens around the palace: Plaza de Oriente, Sabatini and Campo del Moro.